Kings Point in Tamarac is a 55+ community in Broward County, Florida. This community consists of 4,869 condominiums, villas and coach homes available on a resale-only basis. Residents of Kings Point enjoy a myriad of resort-style amenities aimed at keeping homeowners both socially and physically active. The surrounding area offers great opportunities for shopping, dining, and entertainment. Situated between the Florida Turnpike and Sawgrass Expressway, residents looking to travel to other parts of Florida can do so easily. Kings Point in Tamarac offers its residents an impressive array of amenities. Inside the main clubhouse residents can work out in the fitness center, join in a game of cards in the card room, or shoot some pool in the billiards room. The performance theater is great for speakers and plays while the ballroom hosts community parties and functions. Outside the main clubhouse is a resort-style pool and five tennis courts. The secondary clubhouse is called Kings Court clubhouse. Here residents can utilize any one of the numerous multi-purpose rooms for private meetings and special events. There are also plenty of satellite amenities like 12 swimming pools, 12 shuffleboard courts, and five tennis courts spread throughout the community. These satellite amenities ensure no resident is ever too far away from being active. 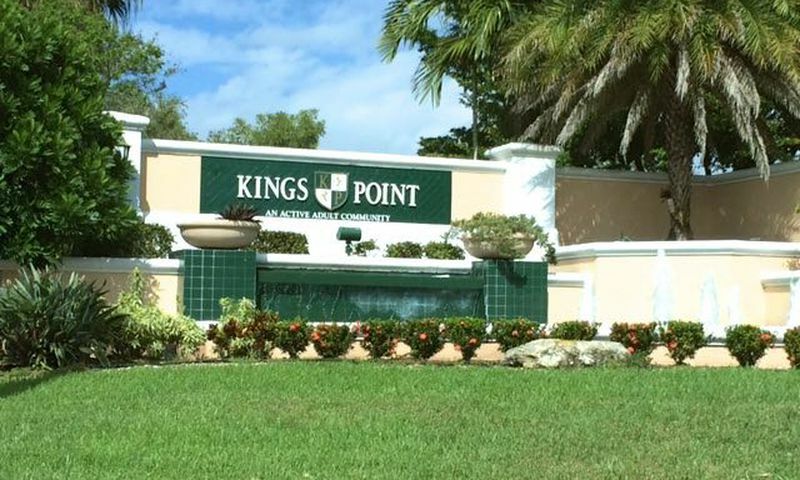 Built between 1983 and 2001, Kings Point in Tamarac consists of 4,869 condos, villas and coach homes available on a resale-only basis. The condominiums are offered in secure two to four-floor buildings with elevator access. These units have one to three bedrooms with one to two-and-a-half bathrooms and lot parking. Condos are a great option for those looking for the ultimate in low-maintenance living. Attached villas are offered to those looking for something a little smaller than a single-family home without giving up functionality. These models offer one to three bedrooms with one-and-a-half to two-and-a-half bathrooms and an attached one-car garage. These homes offer great first-floor living and open floor plans perfect for active adults. The largest homes in the community are the coach homes. These models offer two to four bedrooms, two to two-and-a-half bathrooms and an attached one to two-car garage. With first-floor master suites and additional bedrooms and loft spaces on the second floor, these homes are perfect for having friends and family spend the night. Residents of Kings Point in Tamarac enjoy a great low-maintenance lifestyle along with excellent resort-style amenities. Residents pay an annual homeowners' association fee which covers general maintenance of the community grounds and amenities as well as lawn care and trash removal. This allows homeowners to better spend their days enjoying family and exploring hobbies rather than worrying about tedious tasks. Those looking for some social connection will be able to choose from over 100 clubs and activities. Some of these great clubs include Red Hatters club, book club, investment club, card clubs, snowbird club and the Kings Point Band. There are also numerous activities to keep you active such as water aerobics, aerobic dance club, Zumba, yoga and tennis club. There is something for everyone at Kings Point in Tamarac. Located in Broward County, Florida, Kings Point in Tamarac is surrounded by endless options for entertainment and recreation. Just down the street from the community is the famous Florida Everglades Wildlife Area. This area covers thousands of square miles and is a favorite place for nature lovers and photographers. Another favorite among residents are the numerous white sand beaches located less than ten miles from the community. These Atlantic coastline beaches offer great days trips to relax and enjoy the scenic view. A convenient location with great surroundings and a beautiful climate makes Kings Point in Tamarac a great community for active adults in Southeast Florida. The main clubhouse is open to all residents and offers endless amenities for recreation and entertainment. The Kings Court clubhouse is open to all residents and provides spaces for private meetings and special events. Residents of Kings Point enjoy great satellite amenities ensuring no residents are ever too far from great activities. There are plenty of activities available in Kings Point in Tamarac. Here is a sample of some of the clubs, activities and classes offered here. The condominiums are offered in secure two to four-floor buildings with elevator access. These units range from one to three bedrooms with one to two-and-a-half bathrooms and lot parking. Condos are a great option for those looking for the ultimate in low-maintenance living. Please Note: Floor plans are not available at this time. Attached villas are offered to those looking for something a little smaller than a single-family home without giving up functionality. These models offer between one to three bedrooms with one-and-a-half to two-and-a-half bathrooms and an attached one-car garage. These homes offer great first-floor living and open floor plans perfect for active adults. Please Note: Floor plans are not available at this time. These models offer two to four bedrooms, two to two-and-a-half bathrooms and an attached one to two-car garage. With first-floor master suites and additional bedrooms and loft spaces on the second floor these homes are perfect for having friends and family spend the night. Please Note: Floor plans are not available at this time. 55places.com is not affiliated with the developer(s) or homeowners association of Kings Point in Tamarac. The information you submit is distributed to a 55places.com Partner Agent, who is a licensed real estate agent. The information regarding Kings Point in Tamarac has not been verified or approved by the developer or homeowners association. Please verify all information prior to purchasing. 55places.com is not responsible for any errors regarding the information displayed on this website.